When we think of kiwis, we think of fuzzy, slightly tart, egg-shaped fruits from somewhere in the Southern Hemisphere. However, there is a species (Actinidia chinensis) of kiwi with smooth skin, sweet taste, and golden color. Commonly available cultivars of this species are ‘AU Golden Dragon’ and ‘AU Golden Sunshine’. Most years, kiwis won’t produce much of a crop in North Florida because they won’t receive enough chill hours, but they might be fun to try for the adventurous gardener. Site Selection – Kiwis perform best in well-drained soils with a neutral pH (around 7.0). High winds may cause canes to break and scar fruit, so a windbreak is recommended or they can be planted near a structure. Irrigation – Kiwis need a lot of water during the summer. This is partly due the their large leaves that transpire rapidly because of surface area. Newly planted kiwis should be watered deeply at least once a week. Fertilization – Fertilize kiwis three times a year (January, April, and June). Do not apply fertilizer after the month of July to reduce the incidence of cold injury in the winter. Insects and Diseases – The most common insects of kiwis are mites and scales. To reduce the incidence of disease, plant kiwis at least 15 feet apart and train on a trellis. 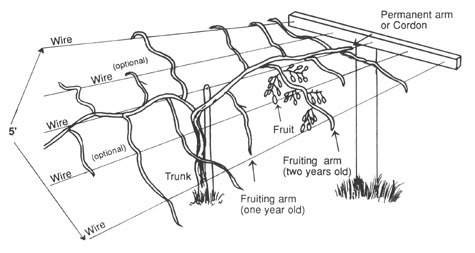 Training – A T-bar trellis, similar to the system used to train grape vines, or a pergola should be used to provide support for the plants. 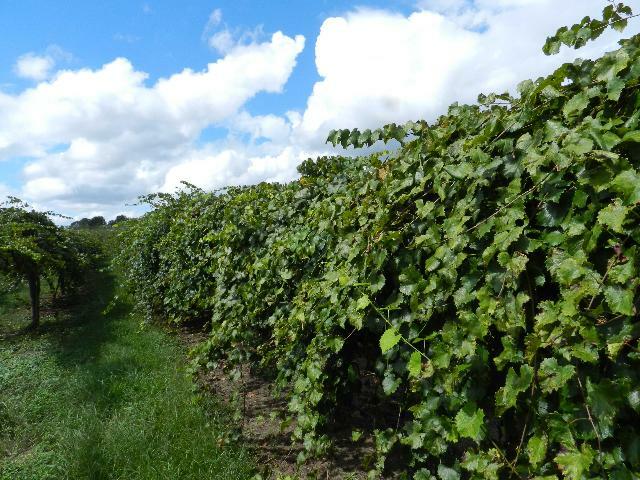 Once the plants are established (2 to 3 years after planting), about a third of the vines should be removed each year. Kiwis are wind- and insect-pollinated. Good growing conditions and insect pollination help increase fruit size. Male and female plants are required for good fruit yields. At least one male (pollen producing) plant should be planted for every four female (fruit producing) plants. 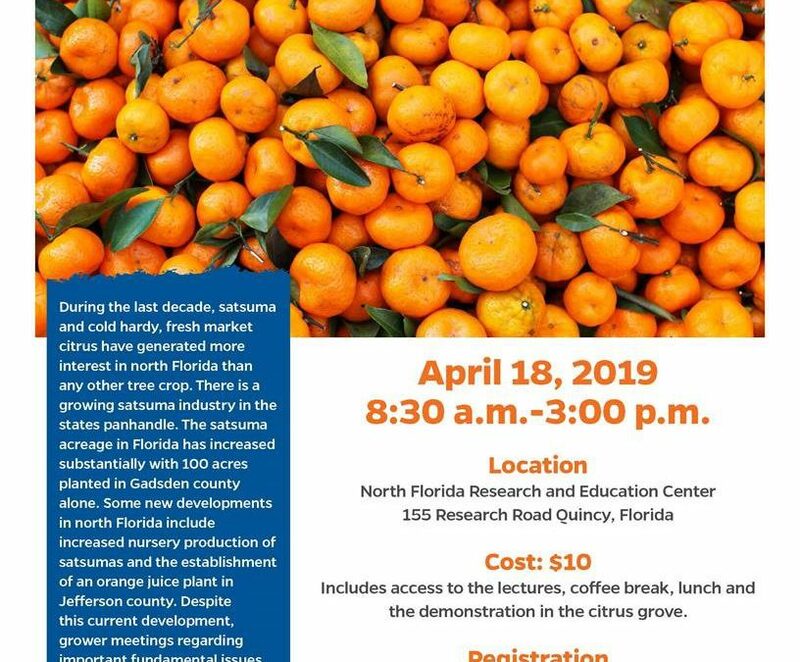 Citrus growers from across the Florida Panhandle, as well as southern Georgia and Alabama are invited to attend the 2019 Citrus Health Forum. 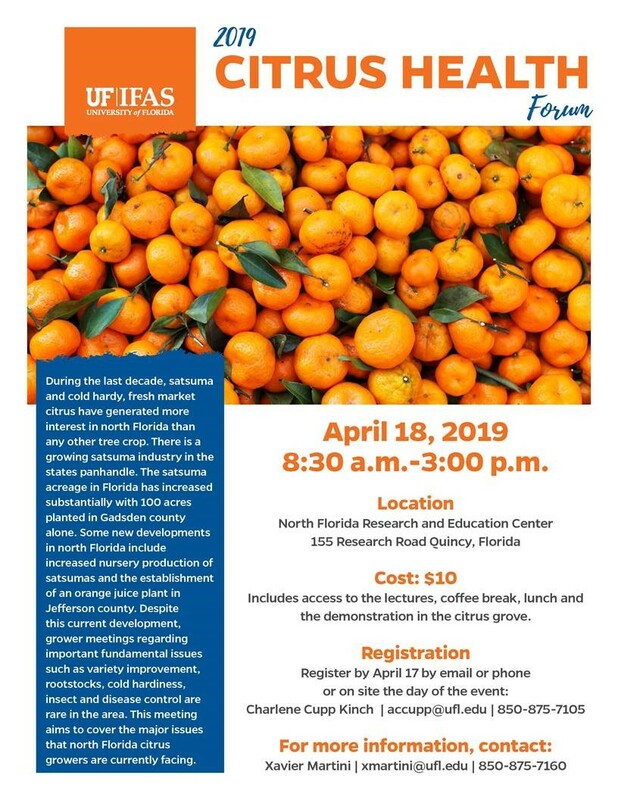 The workshop will be held at the UF/IFAS North Florida Research and Education Center in Quincy (155 Research Road, Quincy, FL). Registration begins at 8:30 AM EST with the meeting starting at 9:00 AM and concluding at 3:00 PM. The workshop registration fee is $10 and includes refreshments and lunch. To register, please contact Charlene at accupp@ufl.edu or by phone at 850-875-7105. For more information on the meeting, or to help sponsor the event, contact Xavier Martini at xmartini@ufl.edu or 850-875-7160. I’m a native of Georgia, growing up just south of the region known as “peach country”. To me, there’s nothing better than a ripe, juicy peach on a summer day. I thought I had seen it at all when it came to peaches. That changed on a trip to the southwest U.S.
A few years ago, I was fortunate to make the voyage to Utah for the National Association of County Agricultural Agents annual meeting. A small group of county agents also participated in a pre-tour of the southwest region of Utah. This is where I found a treasure in the desert, as a host extension agent shared some of his oddly shaped, Saturn peaches from a nearby orchard. The Saturn peach is a favorite in Utah and a favorite for hundreds of years in Asia. 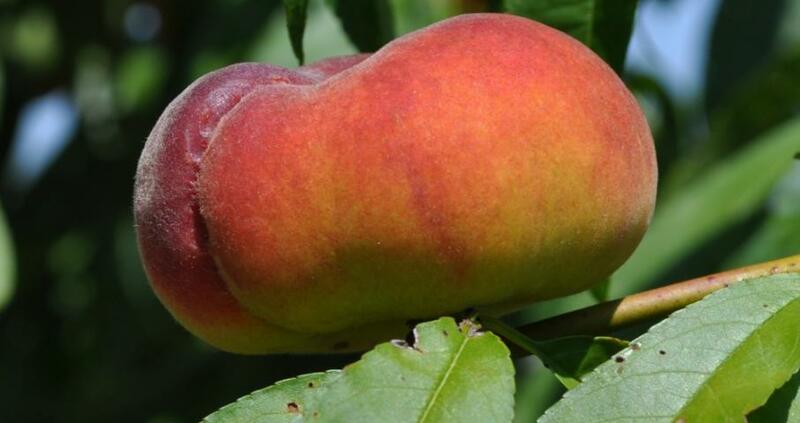 This is an asymmetrically shaped peach, with white, firm flesh. Some refer to this as a “donut peach”. It is an interesting fruit, that I must admit was one of the most delicious peaches that I’ve ever eaten. I began to ponder why this peach variety was one that I had never encountered? After consulting with extension agents in neighboring southeastern states, I found that many universities had experimented with the variety. However, pitfalls in climate acclimation, mechanical harvesting (because the fruit is not round, harvesting equipment can damage) and marketing were discouraging. From a large commercial production interest, even if a viable yield could be grown in the region and custom designed harvesters were feasible, hurdles would still remain regarding the difficulty of marketing an introduced variety that has an unfamiliar and imperfect shape, versus well established varieties that can be graded as select. However, a healthy market may exist for small farms as novelty crop. Furthermore, in 2002 UF/IFAS researchers breed and patented a similar variety of the Saturn peach that thrives anywhere in Florida. The Australia saucer peach was used to breed this new variety, known as the flying saucer or “UFO”. This peach has non-melting flesh with that unique donut shape, not unlike the Saturn. These trees are large and vigorous growing, with a semi-upright growth habit. The UFO produces moderately heavy crop loads of large, firm fruit with yellow flesh and semi-freestone pits that has a fruit development period of 95 days. As seen in figure 1, the skin develops 50–70% blush. This cultivar is particularly susceptible to ethylene that is released during dormant pruning, which can result in significant flower bud abortion. Thus, pruning is only recommended during the summer period. Where do I find such a tree? Growers can purchase from nurseries who are licensed by the University to grow patented varieties. What about homeowners? Check your local garden centers. Now is great time to plant. For more information please contact your local extension office. 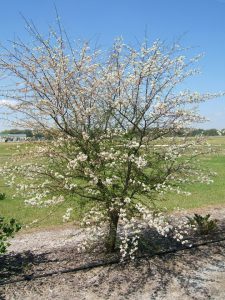 The native Chickasaw plum is a beautiful smaller tree (12-20 ft mature height) that is perfect for front yards, small areas, and streetscapes. 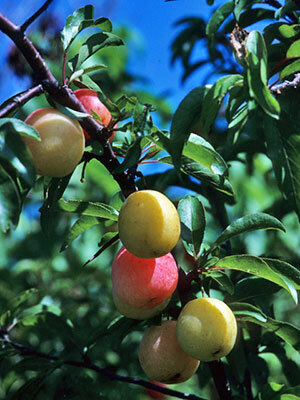 True to its name, the Chickasaw plum was historically an important food source to Native American tribes in the southeast, who cultivated the trees in settlements well before the arrival of Europeans. They typically harvested and then dried the fruit to preserve it. Botanist-explorer William Bartram noted the species during his travels through the southeast in the 1700’s. He rarely saw it in the forests, and hypothesized that it was brought over from west of the Mississippi River. One of the first trees to bloom each spring, the Chickasaw plum’s white, fragrant flowers and delicious red fruit make it charmingly aesthetic and appealing to humans and wildlife alike. The plums taste great eaten fresh from the tree but can be processed into jelly or wine. Chickasaw plums serve as host plants for the red-spotted purple butterfly, and their fruit make them popular with other wildlife. These trees are fast growers and typically multi-trunked. 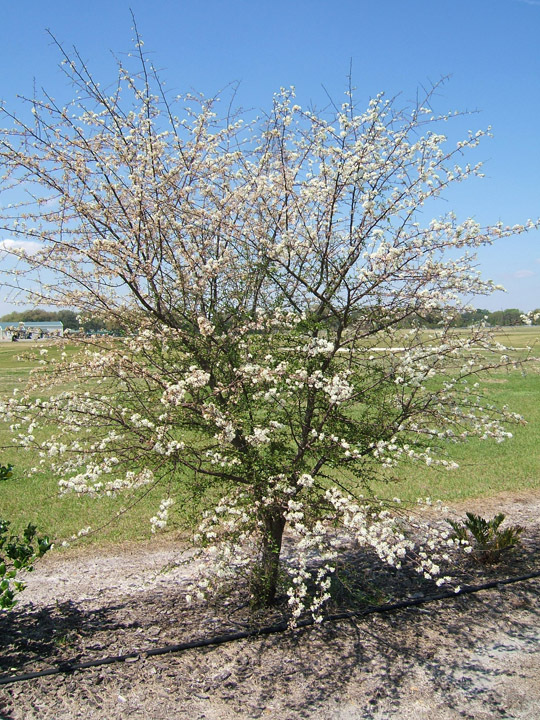 Almost any landscape works for the Chickasaw plum, as it can grow in full sun, partial sun, or partial shade, and tolerates a wide variety of soil types. The species is very drought tolerant and performs well in sandy soils. The plum is in the rose family and has thorns, so it is wise to be aware of these if young children might play near the tree. Winter is ideal tree-planting time in Florida. While national Arbor Day is in spring, Florida’s Arbor Day is the 3rd Friday of January due to our milder winters. This year, Escambia County’s tree giveaway will include Chickasaw plums, so if this tree sounds like a great addition to your landscape, come visit us on January 19 and pick one up. For more information about tree selection in northwest Florida, contact your local county Extension office. A grape vineyard. Credit: Peter Andersen, UF/IFAS. The classic muscadine (Vitis rotundifolia). Credit: Carl Hunter. USDA-PLANTS Database. This is the time of year to be on the watch for purple-stained sidewalks and driveways – a sign that ripe muscadine grapes are falling from above. 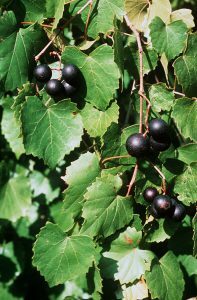 The muscadine grape (Vitis rotundifolia) is a native Florida vine that has been enjoyed by Native Americans, colonists, and contemporary Floridians alike. In addition to the classic muscadine and scuppernong, a light-colored variety of muscadine, there are five other native species of grape (Vitis spp.) to be found growing in natural areas or along woodland edges. All are edible, however, the muscadine has the largest, tastiest fruit. Many north Florida gardeners have some species of grape growing in their landscapes and consider it a weed due to its aggressive growth. 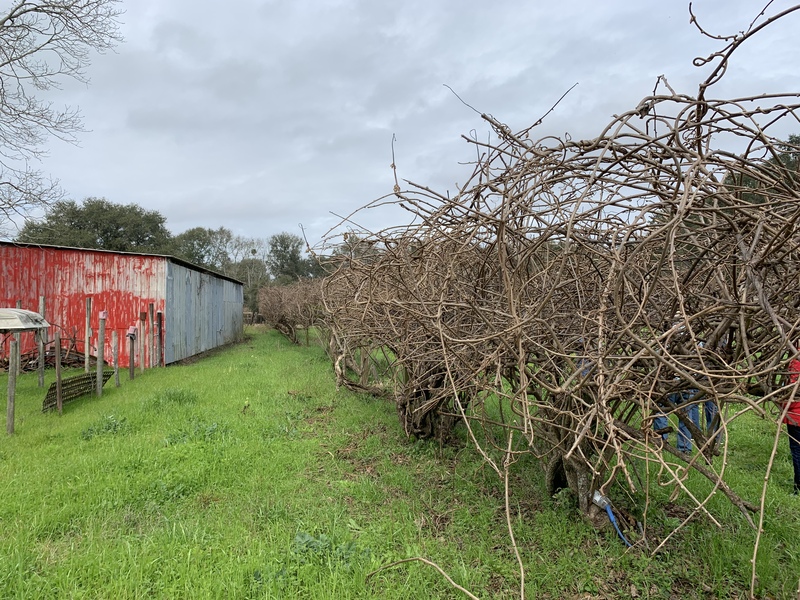 Unfortunately, since the vines are functionally dioecious (separate male and female plants) and most wild plants are male, it is unlikely that those annoying grapevines at the garden’s edge will ever bear fruit. But every now and again, luck strikes! That’s why finding a purple-stained sidewalk or parking area is such an exciting event. I have some of these locations saved in my memory to visit this time of year, especially since all the grapevines in my own property have yet to bear one fruit! If necessary, control methods for grapevine in a landscape include repeated pruning back or the use of herbicides. Muscadines and other grapes are intolerant of shade so will eventually perish if cut back and located under a canopy of trees or shrubs. The bronze-colored scuppernong. Credit: Peter Andersen. UF/IFAS. Good News! There are plenty of varieties bred for the backyard and commercial fruit grower. Since muscadines are native, they require little, if any, pesticides, making them a great choice for a sustainable landscape or orchard. The vines can be grown up an arbor or a complete vineyard trellis system can be built for maximum harvest. 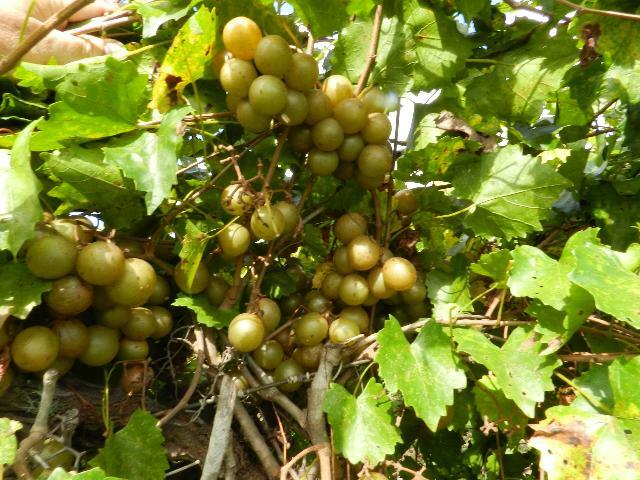 A UF/IFAS fact sheet called “The Muscadine Grape” (publication #HS763) contains all the information needed to choose the right variety, design a vineyard, and implement the best pruning, irrigation, and fertilization schedule. Whether fresh off the vine or in jams or wine, muscadines are a sweet, summery treat for Floridians. flower show. Photo by Dan Stainer/State Archives of Florida. 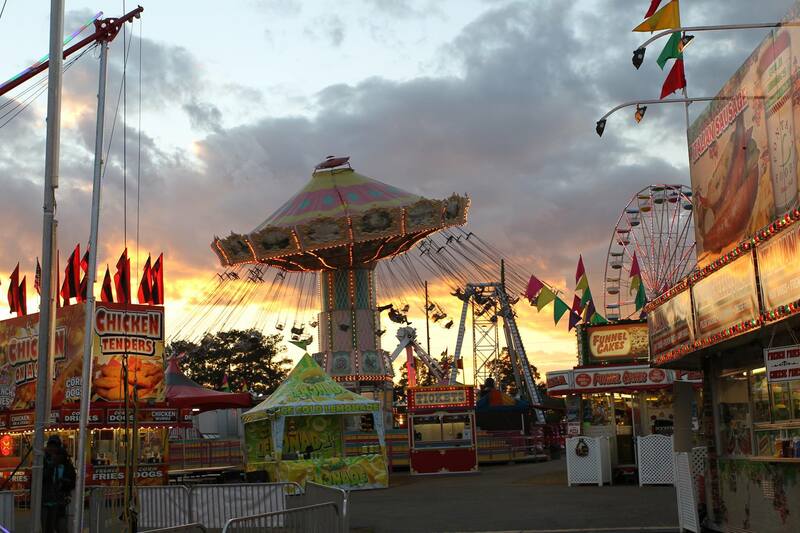 Growing up, as soon as I entered the fair gates, I always headed straight for the rides. If I was lucky, I was able to get an unlimited pass strapped around my wrist and didn’t need to worry about rationing any tickets. Although I usually didn’t remember the names of particular rides – they were clear in my imagination. The spaceship, the circular mini roller coaster, the alien arms… and of course, the Ferris wheel. It wasn’t until I was about a dozen rides in – and starting to feel a little queasy – that the fun houses and win-a-goldfish-by-throwing-a-ring or shoot-a-basketball-for-a-giant-stuffed-tiger games drew my attention. After that, I was ready for funnel cake. Maybe even a corn dog and an assortment of fried cheese, pickles, and the like. Inevitably, I would eat too much and be out of commission for any more rides I was hoping to squeeze in – or squeeze into! This is when I might finally make my rounds through one or two of the giant warehouse-looking buildings that lined the way to the exits, where I knew there was at least a llama or a goat to be fed at the petting zoo. Instead of simply attending the North Florida Fair this year, submit your garden’s best for competition. Photo by North Florida Fair. But when I started volunteering at the Leon County Animal Shelter as part of the 4-H Pet Partners at age 12, I was introduced to these buildings in a whole new light. We were assigned the task of creating papier-mâché cats and dogs to display at the fair to help build awareness of pet overpopulation. I remember my dog well – he was beagle-like, with long droopy paper ears and stiff pointy legs that I struggled to keep balanced. The day we went to set up our display, my adrenaline soared, as I knew our creations were to be judged and ribbons to be bestowed. Ever since, I no longer view the fair buildings as a last stop – rather, I relish my stroll through each of them, as they contain so many handmade treasures, many of which are adorned with blue rosettes of triumph. The tradition of displaying and competing for the best quality handiworks at the fair goes all the way back to the Middle Ages and Renaissance, where merchants sold and traded agricultural goods that had been grown over the summer and freshly harvested in the fall. Naturally, competitions arose during these times, as they strove for the finest products. Today, fairs reflect the personality of an area, and nearly universally include judges who inspect home grown fruits and vegetables, flowers, preserved foods, and baked goods entered into competition by the community. The North Florida Fair awards about $80,000 in cash prizes to citizens who create and grow various items. Anyone living within the 24 counties that comprise North Florida – from the Suwannee, west to the Alabama line – is eligible to enter as many of the exhibit categories as they would like. 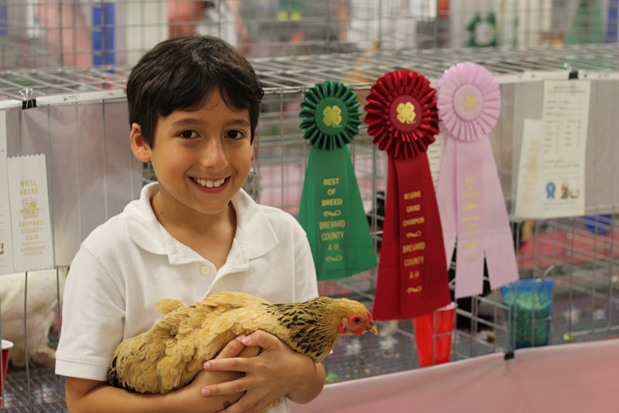 A youth showcasing his prize winning chicken at the North Florida Fair. Photo by Aly Donovan. The exhibits are arranged into various departments, such as Home Agriculture, Capital City Garden Club Flower Show, Poultry, Baked Goods, and Fine Arts and Crafts. Within each department, there are various classes that are split into certain age divisions (i.e., youth only) or experience levels (i.e., amateur vs. professional). Under the Home Agriculture department there are 42 classes, including 13 classes covering fresh vegetables. 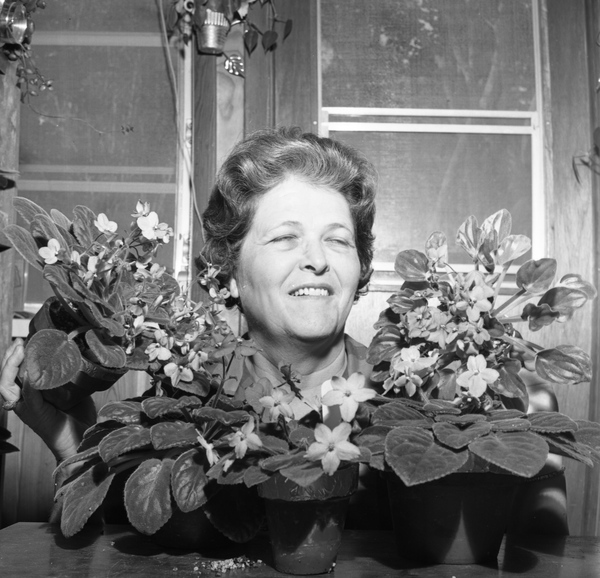 The Capital City Garden Club Flower Show department has 13 classes, including annuals, perennials, hanging baskets, fruiting shrubs, trees, and vines, succulents, and much more. If you would like to submit something you’ve grown, now is the time to begin planning, as this year’s fair is set for November 8-18. All of the details for each department and class can be found on the North Florida Fair website (http://northfloridafair.com/), under the Exhibitors tab. Pay close attention to the application and submittal deadlines for each specific category, as most items are due for judging the week prior to the fair opening. So, let nostalgia win you over as you prepare your home-grown vegetables and flowers for submittal to the North Florida Fair. You might just earn a blue ribbon to be displayed for all fair attendees to admire, either as they walk off a full stomach in preparation for more rides, on their way to the exits, or just as they get started creating their own fond fair memories.